What makes a worship song great? I’ve recently been asked to lead the Youth Band at my church, and it’s got me thinking about songs. There are some songs that we sing in worship that absolutely touch the soul, while there are others that are neither here nor there. 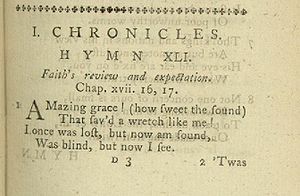 For example, take a look at Amazing Grace. What an amazing song, a powerful testimony for everyone. Yet its composition is incredibly simple. Where as the song “Yours Forever” by Hillsong is a rocking song musically – but do the lyrics move you? As I choose songs for the Youth Band to learn, I’ll hopefully be able to choose a mixture of songs that are moving in both music and lyrics. What is your favourite worship song, and why?